Liczba stron: 379 Jest to ujednolicona liczba stron, która ułatwi Ci porównanie długości książek. Każda strona Legimi to 200 słów. The Bible is the Book of Emancipation of Man. The emancipation of man means his delivery from sorrow and sickness, from poverty, struggle and uncertainty, from ignorance and limitation, and finally from death itself. This may appear to be what the colloquialism of the day would call "a tall order", but nevertheless it is impossible to read the Bible with a mind unwarped by antecedent conceptions derived from traditional interpretation without seeing that this is exactly what it promises, and that it professes to contain the secret whereby this happy condition of perfect liberty may be attained. Jesus says that if a man keeps his saying, he shall never see death (John 8:51); in the Book of Job we are told that if a man has with him "a messenger, an interpreter", he shall be delivered from going down to the pit, and shall return to the days of his youth (Job 33:2325); the Psalms speak of our renewing our youth (Psalm 103:5); and yet again we are told in Job that by acquainting ourselves with God we shall be at peace, we shall lay up gold as dust and have plenty of silver, we shall decree a thing and it shall be established unto us (Job 22:2128). Now, what I propose is that we shall reread the Bible on the supposition that Jesus and these other speakers really meant what they said. Of course, from the standpoint of the traditional interpretation this is a startling proposition. The traditional explanation assumes that it is impossible for these things to be literally true, and therefore it seeks some other meaning in the words, and so gives them a "spiritual" interpretation. But in the same manner we may spiritualize away an Act of Parliament; and it hardly seems the best way of getting at the meaning of a book to follow the example of the preacher who commenced his discourse with the words, "Beloved brethren, the text doth not mean what it saith." Let us, however, start with the supposition that these texts do mean what they say, and try to interpret the Bible on these lines. It will at least have the attraction of novelty; and I think if the reader gives his careful attention to the following pages, he will see that this method carries with it the conviction of reason. If a thing is true at all, there is a way in which it is true, and when the way is seen, we find that to be perfectly reasonable which, before we understood the way, appeared unreasonable. We all go by railroad now, yet they were esteemed levelheaded practical men in their day who proposed to confine George Stephenson as a lunatic for saying that it was possible to travel at thirty miles an hour. The first thing to notice is that there is a common element running through the texts I have quoted: they all contain the idea of acquiring certain information, and the promised results are all contingent on our getting this information, and using it. Jesus says it depends on our keeping his saying, that is, receiving the information which he had to give and acting upon it. Job says that it depends on rightly interpreting a certain message, and again that it depends on our making ourselves acquainted with something; and the context of the passage from the Psalms makes it clear that the deliverance from death and the renewal of youth there promised are to be attained through the "ways" which the Lord "made known unto Moses". In all these passages we find that these wonderful results come from the attainment of certain knowledge, and the Bible therefore appeals to our Reason. From this point of view we may speak of the Science of the Bible, and as we advance in our study, we shall find that this is not a misuse of terms, for the Bible is eminently scientific; only its science is not primarily physical but mental. The Bible contemplates Man as composed of "Spirit, soul, and body" (1 Thess. 5:23), or in other words as combining into a single unity a threefold nature — spiritual, psychic, and corporeal; and the knowledge which it proposes to give us is the knowledge of the true relation between these three factors. The Bible also contemplates the totality of all Being, manifested and unmanifested, as likewise constituting a threefold unity, which may be distributed under the terms, "God", "Man", and "the Universe"; and it occupies itself with telling us of the interaction, both positive and negative, which goes on between these three. Furthermore, it bases this interaction upon two great psychological laws, namely, that of the creative power of Thought and that of the amenability of Thought to control by Suggestion; and it affirms that this Creative Power is as innately inherent in Man's Thought as in the Divine Thought. But it also shows how through ignorance of these truths we unknowingly misuse our creative power, and so produce the evils we deplore; and it also realizes the extreme danger of recognizing our power before we have attained the moral qualities which will fit us to use it in accordance with those principles which keep the great totality of things in an abiding harmony; and to avoid this danger, the Bible veils its ultimate meaning under symbols, allegories, and parables. But these are so framed as to reveal this ultimate meaning to those who will take the trouble to compare the various statements with one another, and who are sufficiently intelligent to draw the deductions which follow from thus putting two and two together; while those who cannot thus read between the lines are trained into the requisite obedience suited to the present extent of their capacity, and are thus gradually prepared for the fuller recognition of the Truth as they advance. Involution and Evolution Seen in this light, the Bible is found not to be a mere collection of old-world fables or unintelligible dogmas, but a statement of great universal laws, all of which proceed simply and naturally from the initial truth that Creation is a process of Evolution. Grant the evolutionary theory, which every advance in modern science renders clearer, and all the rest follows, for the entire Bible is based upon the principle of Evolution. But the Bible is a statement of Universal law, of that which obtains in the realm of the invisible as well as that which obtains in the realm of the visible, and therefore it deals with the facts of a transcendental nature as well as with those of the physical plane; and accordingly it contemplates an earlier process anterior to Evolution — the process, namely, of Involution: the passing of Spirit into Form as antecedent to the passing of Form into Consciousness. If we bear this in mind, it will throw light on many passages which must remain wrapped in impenetrable obscurity until we know something of the psychic principles to which they refer. The fact that the Bible always contemplates Evolution as necessarily preceded by Involution should never be lost sight of, and therefore much of the Bible requires to be read as referring to the involutionary process taking place upon the psychic plane. But Involution and Evolution are not opposed to one another; they are only the earlier and later stages of the same process: the perpetual urging onward of Spirit for Self-expression in infinite varieties of Form. And therefore the grand foundation on which the whole Bible system is built up is that the Spirit, which is thus continually passing into manifestation, is always the same Spirit. In other words, it is only ONE. These two fundamental truths — that under whatever varieties of Form, the Spirit is only ONE; and that the creation of all forms, and consequently of the whole world of conscious relations, is the result of Spirit's ONE mode of action, which is Thought — are the basis of all that the Bible has to teach us, and therefore from its first page to its last, we shall find these two ideas continually recurring in a variety of different connections: the ONEness of the Divine Spirit and the Creative Power of man's Thought, which the Bible expresses in its two grand statements, that "God is ONE", and that Man is made "in the image and likeness of God". These are the two fundamental statements of the Bible, and all its other statements flow logically from them. And since the whole argument of Scripture is built up from these premises, the reader must not be surprised at the frequency with which our analysis of that argument will bring us back to these two initial propositions. So far from being a vain repetition, this continual reduction of the statements of the Bible to the premises with which it originally sets out is the strongest proof that we have in them a sure and solid foundation on which to base our present life and our future expectations. But there is yet another point of view from which the Bible appears to be the very opposite of a logically accurate system built up on the broad foundations of Natural Law. From this point of view it at first looks like the egotistical and arrogant tradition of a petty tribe, the narrow book of a narrow sect, instead of a statement of Universal Truth; and yet this aspect of it is so prominent that it can by no means be ignored. It is impossible to read the Bible and shut our eyes to the fact that it tells us of God making a covenant with Abraham, and thenceforward separating his descendants by a divine interposition from the remainder of mankind; for this separation of a certain portion of the race as special objects of the Divine favour forms an integral part of Scripture from the story of Cain and Abel to the description of "the camp of the saints and the beloved city" in the Book of Revelation. We cannot separate these two aspects of the Bible, for they are so interwoven with one another that if we attempt to do so, we shall end by having no Bible left, and we are therefore compelled to accept the Bible statements as a whole or reject it altogether, so that we are met by the paradox of a combination between an all-inclusive system of Natural Law and an exclusive selection which at first appears to flatly contradict the processes of Nature. Is it possible to reconcile the two? The answer is that it is not only possible, but that this exclusive selection is the necessary consequence of the Universal law of Evolution when working in the higher phases of individualism. It is not that those who do not come within the pale of this Selection suffer any diminution, but that those who do come within it receive thereby a special augmentation and, as we shall see by and by, this takes place by a purely natural process resulting from the more intelligent employment of that knowledge which it is the purpose of the Bible to unfold to us. These two principles of the inclusive and the exclusive are intertwined in a double thread which runs all through Scripture, and this dual nature of its statements must always be borne in mind if we would apprehend its meaning. Asking the reader, therefore, to carefully go over these preliminary remarks as affording the clue to the reason of the Bible statements, I shall now turn to the first chapter of Genesis. The opening announcement that "in the beginning God created the heaven and the earth" contains the statement of the first of these two propositions which are the fundamental premises from which the whole Bible is evolved. From the Master's instruction to the woman of Samaria we know that "God" means "Spirit"; not "a Spirit", as in the Authorized Version, thus narrowing the Divine Being with the limitations of individuality, but as it stands in the original Greek, simply "Spirit" — that is, all Spirit, or Spirit in the Universal. Thus the opening words of the Bible may be read, "in the beginning Spirit" — which is the statement of the underlying Universal Unity. Here let me draw attention to the twofold meaning of the words "in the beginning". They may mean first in order of time, or first in order of causation, and the latter meaning is brought out by the Latin version, which commences with the words "in principio" — that is, "in principle". This distinction should be borne in mind, for in all subsequent stages of evolution the initial principle which gives rise to the individualized entity must still be in operation as the fons et origo of that particular manifestation just as much as in its first concentration; it is the root of the individuality, without which the individuality would cease to exist. It is the "beginning" of the individuality in order of causation, and this "beginning" is, therefore, a continuous fact, always present and not to be conceived of as something which has been left behind and done with. The same principle was, of course, the "beginning" of the entity in point of time also, however far back in the ages we may suppose it to have first evolved into separate existence, so that whether we apply the idea to the cosmos or to the individual, the words "in the beginning" both carry us back to the primordial outpush from non-manifestation into manifestation, and also rivet our attention upon the same power as still at work as the causal principle both in ourselves and in everything else around us. In both these senses, then, the opening words of the Bible tell us that the "beginning" of everything is "God", or Spirit in the Universal. The next statement — that God created the heaven and the earth — brings us to the consideration of the Bible way of using words. The fact that the Bible deals with spiritual and psychic matters makes it of necessity an esoteric book, and therefore, in common with all other esoteric literature, it makes a symbolic use of words for the purpose of succinctly expressing ideas which would otherwise require elaborate explanation, and also for the purpose of concealing its meaning from those who are not yet safely to be entrusted with it. 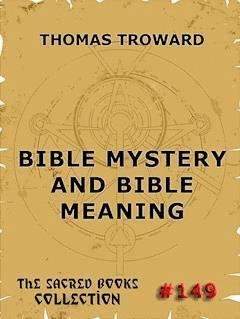 But this need not discourage the earnest student, for by comparing one part of the Bible with another he will find that the Bible itself affords the clue to the translation of its own symbolical vocabulary. Here, as in so many other instances, the Master has given us the key to the right interpretation. He says that the Kingdom of Heaven is within us; in other words, that "Heaven" is the kingdom of the innermost and spiritual; and if so, then by necessary implication "Earth" must be the symbol of the opposite extreme and must metaphorically mean the outermost and material. We are starting the history of the evolution of the world in which we live; that is to say, this Power, which the Bible calls "God", is first presented to us in the opening words of Genesis at a stage immediately preceding the commencement of a stupendous work. Now what are the conditions necessary for the doing of any work? Obviously there must be something that works and something that is worked upon — an active and a passive factor; an energy and a material on or in which that energy operates. This, then, is what is meant by the creation of Heaven and Earth; it is that operation of the eternally subsisting ONE upon Itself which produces its dual expression as Energy and Substance. And here remark carefully that this does not mean a separation, for Energy can only be exhibited by reason of something which is energized; or, in other words, for Life to manifest at all, there must be something that lives. This is an all-important truth, for our conception of ourselves as beings separate from the Divine Life is the root of all our troubles. In its first verse, therefore, the Bible starts us with the conception of Energy or Life inherent in substance and shows us that the two constitute a dual-unity which is the first manifestation of the Infinite Unmanifested ONE; and if the reader will think these things out for himself, he will see that these are primary intuitions the contrary of which it is impossible to conceive. He may, if he please, introduce a Demiurge as part of the machinery for the production of the world, but then he has to account for this Demiurge, which brings him back to the Undistributed ONE of which I speak, and its first manifestation as Energy-inherent-in-Substance; and if he is driven back to this position, then it becomes clear that his Demiurge is a totally unnecessary wheel in the train of evolutionary machinery. And the gratuitous introduction of a factor which does no work but what could equally be done without it is contrary to anything we can observe in Nature or can conceive of a Self evolving Power. But we are particularly cautioned against the mistake of supposing that Substance is the same thing as Form, for we are told that the "earth was without form". This is important because it is just here that a very prolific source of error in metaphysical studies creeps in. We see Forms which, simply as masses, are devoid of an organized life corresponding to the particular form, and therefore we deny the inherency of Energy or Life in ultimate substance itself. As well deny the pungency of pepper because it is not in the particular pepper pot we are accustomed to. No, that primordial state of Substance with which the opening verse of the Bible is concerned is something very far removed from any conception we can have of Matter as formed into atoms or electrons. We are here only at the first stage of Involution, and the presence of material atoms is a stage, and by no means the earliest, in the process of Evolution. We are next told that the Spirit of God moved upon the face of the waters. Here we have two factors, "Spirit" and "Water", and the initial movement is attributed to Spirit. This verse introduces us to that particular mode of manifestation of the Universal Substance which we may denominate the Psychic. This psychic mode of the Universal Substance may best be described as Cosmic Soul-Essence — not, indeed, universal in the strictest sense otherwise than as always included in the original Primordial Essence, but universal to the particular world-system under formation, and as yet undifferentiated into any individual forms. This is what the medieval writers spoke of as "the Soul of the Universe", or Anima Mundi, as distinguished from the Divine Self, or Animus Dei, and it is the universal psychic medium in which the nuclei of the forms hereafter to become consolidated on the plane of the concrete and material take their inception in obedience to the movement of the Spirit, or Thought. This is the realm of Potential Forms, and is the connecting link between Spirit, or pure Thought, and Matter, or concrete Form, and as such plays a most important part in the constitution of the Cosmos and of Man. In our reading of the Bible as well as in our practical application of Mental Science, the existence of this intermediary between Spirit and Matter must never be lost sight of. We may call it the Distributive Medium, in passing through which the hitherto undistributed Energy of Spirit receives differentiation of direction and so ultimately produces differentiation of forms and relations on the outermost or visible plane. This is the Cosmic Element which is esoterically called "Water", and so long ago as the reign of Henry VIII, Dean Colet explains it thus in a letter to his friend Randulph. Dean Colet was very far from being a visionary. He was one of the precursors of the Reformation in England, and among the first to establish the study of Greek at Oxford; and as the founder of St Paul's School in London, he took a leading part in introducing the system of public school education which is still in operation in this country. There is no mistaking Dean Colet for any other than a thoroughly levelheaded and practical man, and his opinion as to the meaning of the word "Water" in this connection therefore carries great weight. But we have the utterance of a yet higher authority on this subject, for the Master himself concentrates his whole instruction to Nicodemus on the point that the New Birth results from the interaction of "Spirit" and "Water", especially emphasizing the fact that "the flesh" has no share in the operation. This distinction between "the flesh", or the outermost principle, and "Water" should be carefully noted. The emphasis laid by the Master on the nothingness of "the flesh" and the essentialness of "Water" must mark a distinction of the most important kind, and we shall find it very helpful in unraveling the meaning of many passages of the Bible to grasp this distinction at the outset. The action of "Spirit" upon "Water" is that of an active upon a passive principle; and the result of any sort of Work is to reconstruct the material worked upon into a form which it did not possess before. Now the new form to be produced, whatever it may be, is a result and therefore is not to be enumerated among the causes of its own production. Hence it is a self obvious truism that any act of creative power must take place at a more interior level than that of the form to be created; and accordingly, whether in the Old or the New Testament, the creative action is always contemplated as taking place between the Spirit and the Water, whether we are thinking of producing a new world or a new man. We must always go back to First Cause operating on Primary Substance. We are told that the first product of the movement of Spirit upon Water was Light, thereby suggesting an analogy with the discoveries of modern science that light and heat are modes of motion. But the statement that the Sun was not created till the fourth day guards us against the mistake of supposing that what is here meant is the light visible to the physical eye. Rather, it is that All-pervading Inner Light, of which I shall have more to say by and by, and which only becomes visible as the corresponding sense of inward vision begins to be developed; it is that psychic condition of the Universal Substance in which the auras of the potentials of all forms may be discovered and where, consciously or unconsciously, the Spirit determines the forms of those things which are to be. Like all other knowledge, the knowledge of the Inner Light is capable of application at higher and at lower levels, and the premature recognition of its power at the lower levels, uncontrolled by the recognition of its higher phases, is one of the most dangerous acquisitions; but duly regulated by the higher knowledge, the lower is both safe and legitimate, for in its due order it also is part of the Universal Harmony. The initial Light having thus been produced, the introduction of the firmament on the second day indicates the separation of the spiritual principles of the different members of the world-system from one another, and the third day sees the emanation of Earth from "the Water", or the production of the actual corporeal system of Nature — the commencement of the process of Evolution. Up to this point the action has been entirely upon the inner plane of "Water" — that is to say, a process of Involution — and consistently with this it was impossible for the heavenly bodies to begin giving physical light until the fourth day, for until then no physical sun or planets could have existed. With the fourth day, however, the physical universe is differentiated into shape; and on the fifth day the terrestrial waters begin to take their share in the evolutionary process by spontaneously producing fish and fowl. And here we may remark in passing how Genesis has forestalled modern science in the discovery that birds are anatomically more closely related to fishes than to land animals. The terrestrial earth (I call it so to distinguish it from symbolic "earth"), already on the third day impregnated with the vegetable principle, takes up the evolutionary work on the sixth day, producing all those other animal races which had not already originated in the waters, and the the preparation of the world as an abode for Man is completed. It would be difficult to give a more concise statement of Evolution. Originating Spirit subsists at first as simple Unity; then it differentiates itself into the active and passive principles spoken of as "Heaven" and "Earth", or "Spirit" and "Water". From these proceed Light, and the separation into their respective spheres of the spiritual principles of the different planets, each carrying with it the potential of the self-reproducing power. Then we pass into the realm of realization, and the work that has been done on the interior planes is now reproduced in physical manifestation, thus marking a still further unfoldment; and finally, in the phrases "let the waters bring forth" and "let the earth bring forth", the land and water of our habitable globe are distinctly stated to be the sources from which all vegetable and animal forms have been evolved. Thus creation is described as the self-transforming action of the ONE unanalysable Spirit passing by successive transitions into all the varieties of manifestations that fill the Universe. And here we may notice a point which has puzzled commentators unacquainted with the principles on which the Bible is written. This is the expression "the evening and the morning were the first, second, etc., day". Why, it is asked, does each day begin with the evening? And various attempts have been made to explain it in accordance with Jewish methods of reckoning time. But as soon as we see what the Bible statement of creation is, the reason at once becomes clear. The second verse of the Bible tells us that the starting point was Darkness, and the coming forth of Light out of Darkness cannot be stated in any other order than the dawning of morning from night. It is the dawning into manifestation out of non-manifestation, and this happens at each successive stage of the evolutionary process. We should notice, also, that nothing is said as to the remainder of each day. All that we hear of each day is as "the morning", thus indicating the grand truth that when once a Divine day opens, it never again descends into the shades of night. It is always "morning". The Spiritual Sun is always climbing higher and higher, but never passes the zenith or commences to decline — a truth which Swedenborg expresses by saying that the Spiritual Sun is always seen in the eastern heavens at an angle of forty-five degrees above the horizon. What a glorious and inspiring truth: when once God begins a work, that work will never cease, but will go on forever expanding into more and more radiant forms of strength and beauty, because it is the expression of the Infinite, which is Itself Love, Wisdom, and Power. These days of creation are still in their prime and forever will be so, and the germs of the New Heaven and the New Earth which the Bible promises are already maturing in the heaven and earth that now are, as St Paul tells us, waiting only for the manifestation of the Sons of God to follow up the old principle of Evolution to still further expansion in the glory that shall be revealed. As himself included in the great Whole, Man is no exception to the Universal Law of Evolution. It has often been remarked that the account of his creation is twofold, the two statements being contained in the first and second chapters of Genesis respectively. But this is precisely in accordance with the method adopted regarding the rest of creation. First we are told of the creation in the realm of the invisible and psychic — that is to say, the process of Involution; and afterwards we are told of the creation on the plane of the concrete and material — that is to say, the process of Evolution. And since Involution is the cause and Evolution the effect, the Bible observes this order both in the account of the creation of the world and in that of the creation of Man. In regard to his physical structure, Man's body, we are told, is formed from the "earth" — that is, by a combination of the same material elements as all other concrete forms; and thus in the physical Man, the evolutionary process attains its culmination in the production of a material vehicle capable of serving as the starting point for a further advance, which has now to be made on the Intellectual and Spiritual. The principle of Evolution is never departed from, but its further action now includes the intelligent cooperation of the evolving Individuality itself as a necessary factor in the work. The development of merely animal Man is the spontaneous operation of Nature, but the development of the mental Man can only result from his own recognition of the Law of Self-expression of Spirit as operating in himself. It is, therefore, for the setting forth of Man's power to use this Law that the Bible was written; and accordingly, the great fact on which it seeks to rivet our attention in its first utterance regarding Man is that he is made in the image and likeness of God. A very little reflection will show us that this likeness cannot be in the outward form, for the Universal Spirit in which all things subsist cannot be limited by shape. It is a Principle permeating all things as their innermost substance and vivifying energy, and of it the Bible tells us that "in the beginning" there was nothing else. Now the one and only conception we can have of this Universal Life-Principle is that of the Creative Power producing infinitely varied expressions of itself by Thought, for we cannot ascribe any other initial mode of movement to Spirit but that of thought — although as taking place in the Universal, this mode of Thought must necessarily be, relatively to the individual and particular, a subconscious activity. The likeness, therefore, between God and man must be a mental likeness, and since the only fact which, up to this point, the Bible has told us regarding the Universal Mind is its Creative Power, the resemblance indicated can only consist in the reproduction of the same Creative Power in the Mind of Man. As we progress, we shall find that the whole Bible turns on this one fundamental fact. The Creative Power is inherent in our Thought, and we can by no means divest ourselves of it; but because we are ignorant that we possess this power, or because we misapprehend the conditions for its beneficial employment, we need much instruction in the nature of our own as yet unrecognized possibilities; and it is the purpose of the Bible to give us this teaching. A little consideration of the terms of the evolutionary process will show us that since there is no other source from which it can proceed, the Individual Mind, which is the essential entity that we call Man, can be no other than a concentration of the Universal Mind into individual consciousness. Man's Mind is, therefore, a miniature reproduction of the Divine Mind, just as fire has always the same igneous qualities whether the centre of combustion be large or small; and so it is on this fact that the Bible would fix our attention from first to last, knowing that if the interior realm of Causation be maintained in a harmonious order, the external realm of Effects is certain to exhibit corresponding health, happiness, and beauty. And further, if the human mind is the exact image and likeness of the Divine, then its creative power must be equally unlimited. Its mode is different, being directed to the individual and particular, but its quality is the same; and this becomes evident if we reflect that it is not possible to set any limit to Thought, and that its only limitations are such as are set by the limited conceptions of the individual who thinks. And it is precisely here that the difficulty comes in. Our Thought must necessarily be limited by our conceptions. We cannot think of something which we cannot conceive; and therefore, the more limited our conceptions, the more limited will be our thought, and its creations will accordingly be limited in a corresponding degree. It is for this reason that the ultimate purpose of all true instruction is to lead us into that Divine Light where we shall see things beyond the range of any past experiences — things which have not emerged into the heart of man to conceive, revealings of the Divine Spirit opening to us untold worlds of splendour, delight, and unending achievement. But in our earlier stages of development, where we are still surrounded by the mists of ignorance, this correspondence between the range of Thought's creations and the range of our conceptions brings about the catastrophe of "the Fall", which forms the subject of our next chapter. In the last chapter we reached the conclusion that in the nature of things, Thought must always be limited by the range of the intelligence which gives rise to it. The power of Thought as the creative agent is perfectly unlimited in itself, but its action is limited by the particular conception which it is sent forth to embody. If it is a wide conception based upon an enlarged perception of truth, the thought which dwells upon it will produce corresponding conditions. This is self-evident; it is simply the statement that an instrument will not do work to which the hand of the workman does not apply it; and if the student will only fix this very simple idea in his mind, he will find in it the key to the whole mystery of man's power of self evolution. Let us make our first use of this key to unlock the mystery of the story of Eden. It is hardly necessary to say that the story of Eden is an allegory: that is clearly shown by the nature of the two trees that grew in the centre of the garden — the Tree of the Knowledge of Good and Evil and the Tree of Life. This allegory is one repeated in many lands and ages, as in the classical fable of the Garden of the Hesperides and in the medieval Romance of the Rose; always the idea is repeated in a garden in whose centre grows some life-giving fruit or flower which is the reward of him who discovers the secret by which the centre of the garden may be reached. The meaning in all these stories is the same. The garden is the Garden of the Soul, and the Tree of Life is that innermost perception of Spirit of which the Master said that it would be a well of water springing up to everlasting life to all who realized it. It is the garden which elsewhere in Scripture is called "the garden of the Lord"; and in accordance with the nature of the garden, the plants which grow in it — and which man has to tend and cultivate — are thoughts and ideas; and the chief of them are his idea of Life and his idea of Knowledge, and these occupy the centre of the garden because all our ideas must take their colour from them. We must recollect that human life is a drama whose action takes place in three worlds, and therefore, in reading the Bible, we must always make sure which world we are at any moment reading about — the spiritual, the intellectual, or the physical. In the spiritual world, which is that of the supreme ideal, there exists nothing but the potential of the absolutely perfect; and it is on this account that in the opening chapter of the Bible we read that God saw that all his work was good — the Divine eye could find no flaw anywhere; and we should note carefully that this absolutely good creation included Man also. But as soon as we descend to the Intellectual world, which is the world of man's conception of things, it is quite different; and until man comes to realise the truly spiritual, and therefore perfectly good, essential nature of all things, there is room for any amount of misconception, resulting in a corresponding misdirection of man's creative instrument of Thought, which thus produces correspondingly misinformed realities. Now the perfect life of Adam and Eve in Eden is the picture of Man as he exists in the spiritual world. It is not the tradition of some bygone age, but a symbolical representation of what we all are in our innermost being, thus recalling the words of the Master recorded in the Gospel of the Egyptians . He was asked when the Kingdom of Heaven should come and replied, "When that which is without shall be as that which is within" — in other words, when the perfection of the innermost spiritual essence shall be reproduced in the external part. In the story of Man's pristine life of innocence and joy in Paradise, we are reading on the level of the highest of the three worlds. The story of "the Fall" brings us to the envelopment of this spiritual nature in the lower intellectual and material natures, through which alone it can obtain perfect individualization and Man become a reality instead of remaining only a Divine dream. In the allegory, Man is warned by god that Death will be the consequence of eating the fruit of the tree of the Knowledge of Good and Evil. This is not the threat of a sentence to be passed by God, but a warning as to the nature of the fruit itself; but this warning is disregarded by Eve, and she shares the forbidden fruit with Adam, and they are both expelled from Eden and become subject to Death as the consequence. Now if Eden is the garden of the Soul, it is clear that Adam and Eve cannot be separate personages, but must be two principles in the human individuality which are so closely united as to be represented by a wedded pair. What, then, are these principles? St Paul makes a very remarkable statement regarding Adam and Eve. He tells us that "Adam was not deceived, but the woman being deceived was in the transgression" (1 Tim. 2:14). We have, therefore, Bible warrant for saying that Adam was not deceived; but at the same time, the story of the fall clearly shows that he was expelled from Eden for partaking of the fruit of Eve's instigation. To satisfy both statements, therefore, we require to find in Adam and Eve two principles, one of which is capable of being deceived, and is deceived, and falls in consequence of the deception; and the other of which is incapable of being deceived but yet is involved with the fall of the former. This is the problem which has to be worked out, and the names of Adam and Eve supply the solution. Eve, we are told, was so called because she was the mother of all living (Gen. 3:20). Eve, then, is the Mother of Life, a subject to which I shall have to refer again by and by. Eve, both syllables being pronounced, is the same word which in some Oriental languages is written "Hawa", by which name she is called in the Koran, and signifies Breath — the principle which we are told in Genesis 2:7 constitutes Man a living Soul. Adam is rendered in the margin of the Bible "earth" or "red earth", and according to another derivation the name may also be rendered as "Not-breath". And thus in these two names we have the description of two principles, one of which is "Breath" and Life-conveying, while the other is "Not-breath" and is nothing but earth. It requires no great skill to recognise in these the Soul and the Body. Then St Paul's meaning becomes clear. Any work on physiology will tell you that the human body is made up of certain chemical materials — so much chalk, so much carbon, so much water, etc. Obviously these substances cannot be deceived because they have no intelligence, and any deception that occurs must be accepted by the soul or intellectual principle, which is Eve, the mother of the individual life. For the soul of the body form doth take, For soul is form and doth the body make. And since the soul is "the builder of the body", the deception which causes wrong thinking on the part of the intellectual man reproduces itself in physical imperfection and in adverse external circumstances. The Serpent What, then, is the deception which causes the "Fall"? This is figured by the Serpent. The serpent is a very favorite emblem in all ancient esoteric literature and symbolism and is sometimes used in a positive and sometimes in a negative sense. In either case it means life — not the Originating Life-Principle, but the ultimate outcome of that Life-Principle in its most external form of manifestation. This, of course, is not bad in itself. Recognised in full realization of the fact that it comes from God, it is the completion of the Divine work by outward manifestation; and in this sense it becomes the serpent which Moses lifted up in the wilderness. But without the recognition of it as the ultimate mode of the Divine Spirit (which is all that is), it becomes the deadly reptile, not lifted up, but crawling flat upon the ground: it is that ignorant conception of things which cannot see the spiritual element in them and therefore attributes all their energy of action and reaction to themselves, not perceiving that they are the creations of a higher power. Ignorant of the Divine Law of Creation, we do not look beyond secondary causes; and therefore because our own creative thought-power is ever externalizing conditions representative of our conceptions, we necessarily become more and more involved in the meshes of a network of circumstances from which we can find no way of escape. How these circumstances come about we cannot tell. We may call it blind chance, or iron destiny, or inscrutable Providence; but because we are ignorant of the true Law of Primary Causation, we never suspect the real fact, which is that the originating power of all this in-harmony is ourself. This is the great deception. We believe the serpent, or that conception of life which sees nothing beyond secondary causation, and consequently we accept the Knowledge of Evil as being equally necessary with the Knowledge of Good; and so we eat of the tree of Knowledge of Good and of Evil. It is this dual aspect of knowledge that is deadly, but knowledge itself is nowhere condemned in Scripture; on the contrary, it is repeatedly stated to be the foundation of all progress. "Wisdom is a Tree of Life to them that lay hold upon her", says the Book of Proverbs; "salvation is of the Jews because we know what we worship", says Jesus; and so on throughout the Bible. But what is deadly to the soul of Man is the conception that Evil is a subject of Knowledge as well as Good — for this reason: that by thinking of Evil as a subject to be studied, we thereby attribute to it a substantive existence of its own; in other words, we look upon it as something having a self-originating power which, as we advance in our studies, we shall find more and more clearly is not the case. And so, by the Law of the creative working of Thought, we bring the Evil into existence. We have not yet penetrated the great secret of the difference between causes and conditions (as explained in myEdinburgh Lectures on Mental Science).